Stitch Fix is a service that provides a personal stylist to send curated items, personalized to your style & size, directly to your home. You can then try on the items in the comfort of your home & decide whether or not you want to keep them. We have shared a number of Stitch Fix reviews as I have been using Stitch Fix for almost a year. We were excited to find out that Stitch Fix recently started curating boxes for kids! They offer subscription boxes for kids in sizes 2T – 14 for boys & girls. 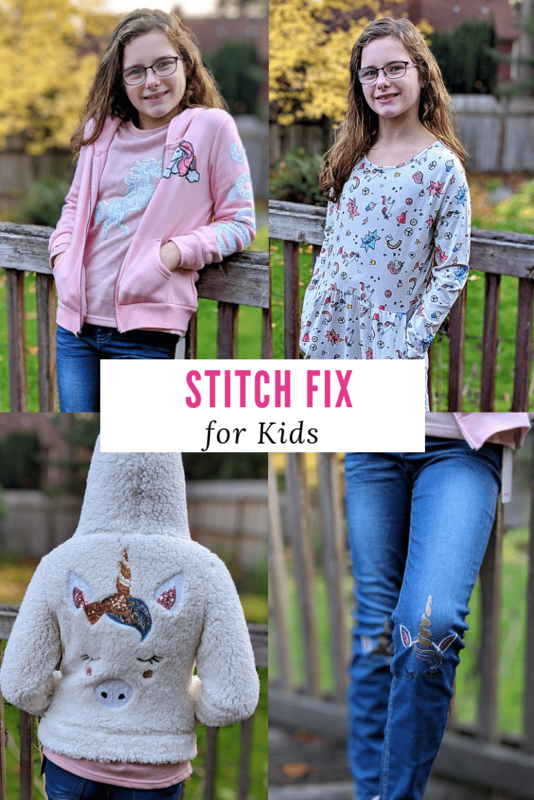 The Stitch Fix Kids boxes are a bit different in that you will be sent between 8 – 12 items and the prices are more budget-friendly, ranging from $10 – $35. Shipping is free with all boxes & you will get free returns with a postage-paid envelope to drop your items in if you choose to return them. So, it’s an easy & seamless process for your kids to try on clothes, shoes and/or accessories, without having to head to a number of stores. And you can return anything your kids don’t want at no cost to you. 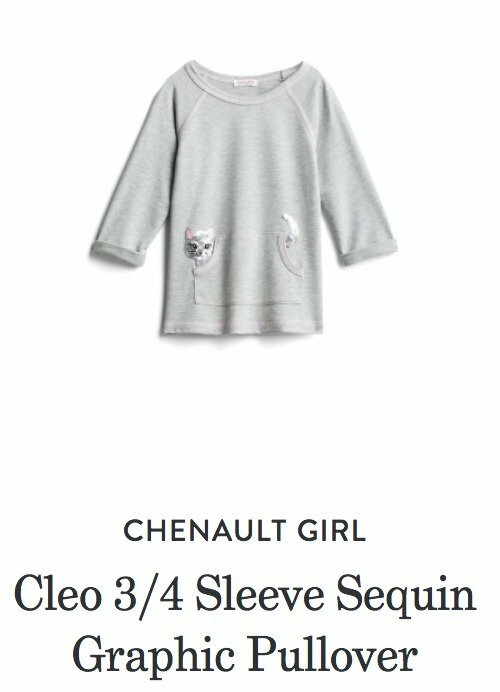 I was excited to try Stitch Fix for kids to find some fun, unique clothing ideas for my daughter who loves clothes & having a box curated & sent right to our doorstep is such a timesaver than hitting up the mall & having to shop from store to store! And she had fun trying them on at home where she could test it out more fully walking around the house, sitting down, etc to make sure they fit well & would be comfortable in different settings. Make sure to check out the unboxing video on Facebook that Olivia and I did showing you everything in her Stitch Fix box. It’s easier to see what the items look like when you watch the video & you can see what Olivia has to say about each of the items, too. There is a $20 styling fee per box with Stitch Fix. However, if you keep any items, that $20 will go towards the cost of the item(s). If you decide you don’t like any of the items, you can send them all back in the postage paid envelope and only pay the $20 styling fee to have tried out the service! But if you decide to keep even just one item, that $20 styling fee will go towards the cost of that item, so you are only paying if you end up sending everything back. Head to Stitch Fix and fill out the Style Questionnaire for each of your kids. This is a very detailed Style Quiz where you can share your child’s size, interests & hobbies, themes they like, etc. You can even include links to Pinterest boards if you have any boards with styles you like. They can choose pictures of themes & styles/fabrics they like. You will then be sent 8-12 items curated by the stylist by mail. This box can include clothes, accessories and shoes (depending on what you asked for in your Style Quiz). This costs $20 to have a Stitch Fix box sent to you (however, if you keep any of the items, you can use the Styling fee towards the cost of an item in the box.) Since Stitch Fix Kids boxes are so new & they are very popular, there may be a wait for them. Review the items in your child’s box & try them on, deciding what he or she will keep or if you will send any back. You have 3 days to do this (although there often is an extension if you click the email they send – this time, it did not give me the option of an extension, so I think that’s b/c it is so popular for kids). You can keep one, two or three, etc & then send any items back that you don’t want. You will have a postage paid Priority Mail envelope to use & all you have to do is drop your bag at the Post Office mailbox within that 3 day timeframe. If you keep even one item, your $20 styling fee will be applied to your purchase of that item(s). Discount for buying ALL of the items – If you choose to keep all the items, you will get an extra 25% off the entire box. That was a savings of $60 for our box – so if your child just does not like maybe 1 or 2 items, it still may be worth it to buy the whole box & save the items in your gift stash for another friend maybe? This works out to an awesome savings on high quality items. Fill out the Box Feedback Form online at Stitch Fix – regardless of whether you keep all the items or return all the items or some of the items, make sure to fill out the Feedback form & checkout before you send back any items from your child’s box. This is where you can have your $20 Styling fee applied to your order (if you keep any items). This is really important to provide the feedback for each item about what your child liked & didn’t like to provide that information for his or her style profile for future Stitch Fix boxes. 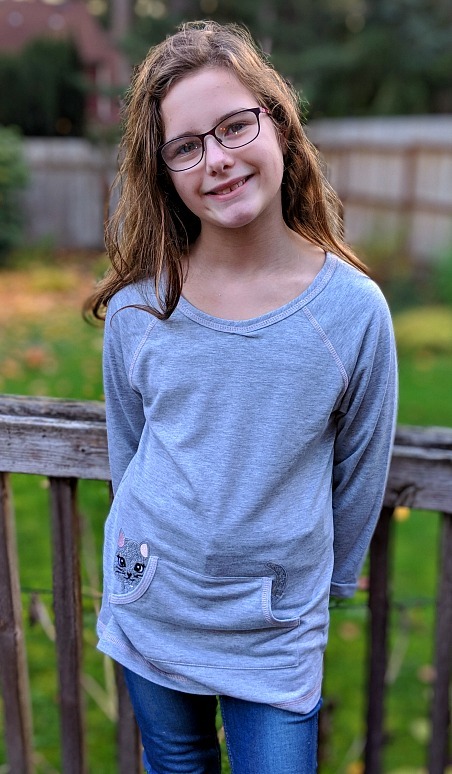 I have to tell you – my daughter’s Stitch Fix stylist was amazing – she totally understood my daughter’s style & found some unique, fun items that she loved! 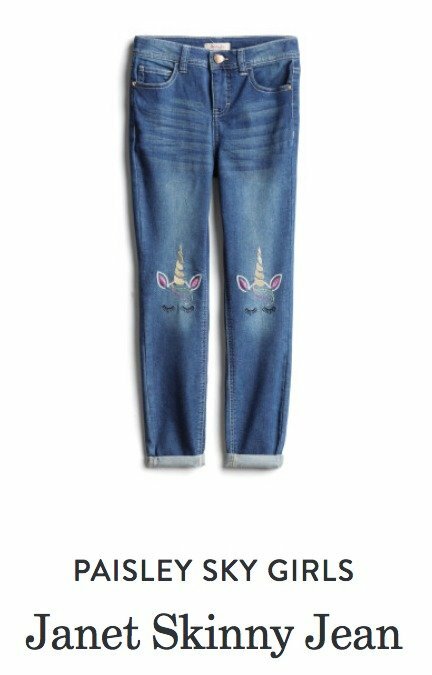 My daughter would seriously wear anything with unicorns & pink every single day if she could, so we shared that in the style questionnaire so that’s what you will see below! There was a range of prices, with the lowest item at $14 & the highest item priced at $30 for the jacket, which is a great price for a multi-use/multi-season jacket here in the Northwest. Several of the prices were a bit higher than the budget we set & looking at the clothes she already had, but they gave us good ideas of the different options and brands to check out for the future. And my little gal often gets hand-me-downs from her sister, so it was fun for her to have such unique items for her personality. Plus, all of the items really felt like they were high quality & would last as my girl is hard on her clothes as she’s so active. 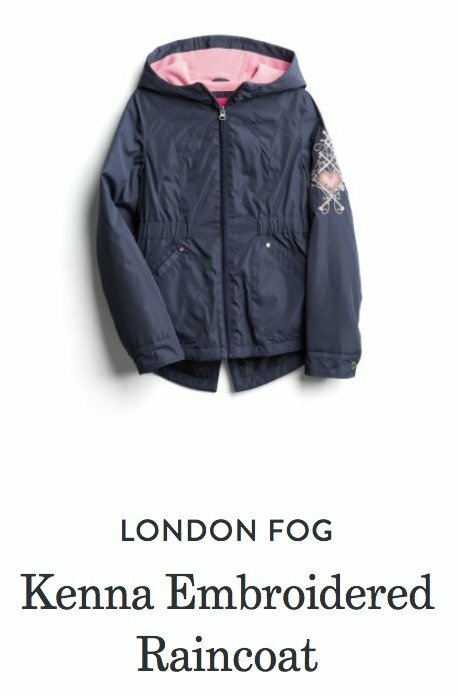 London Fog Kenna Embroidered Raincoat – $30 . 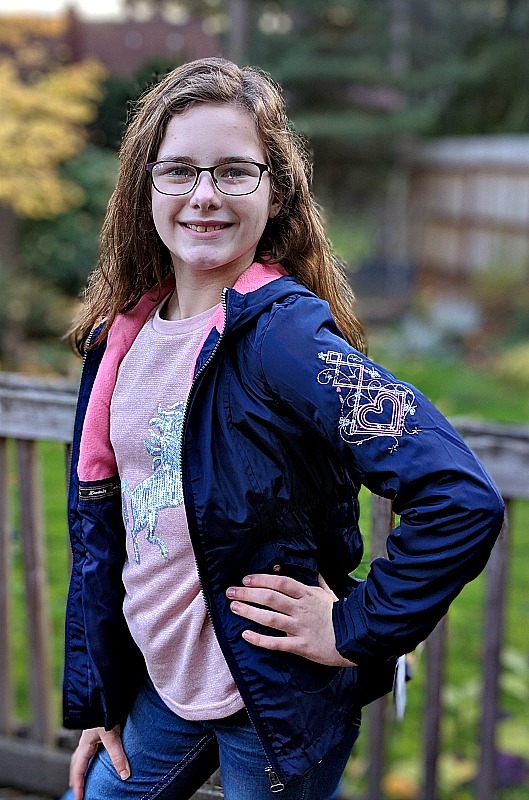 This was the perfect coat for a child in the NW – water-resistant but with some warmth, too, for the mix of weather we get during the fall, spring, summer & some days in the winter, too. 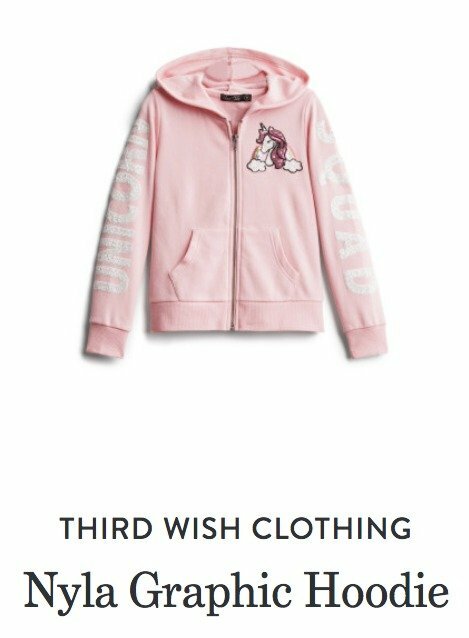 Third Wish Clothing Nyla Graphic Hoodie – $26 – This sweatshirt was adorable – it says “Unicorn Squad” going down the arms. So cute! It’s a nice, heavier sweatshirt that feels very well made. 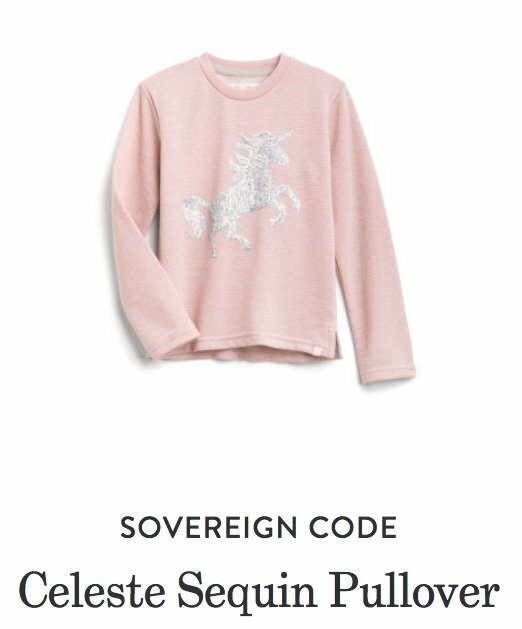 Sovereign Code Celeste Sequin Pullover – $26. This sweater is just adorable in person & so versatile to be dressed up or down. 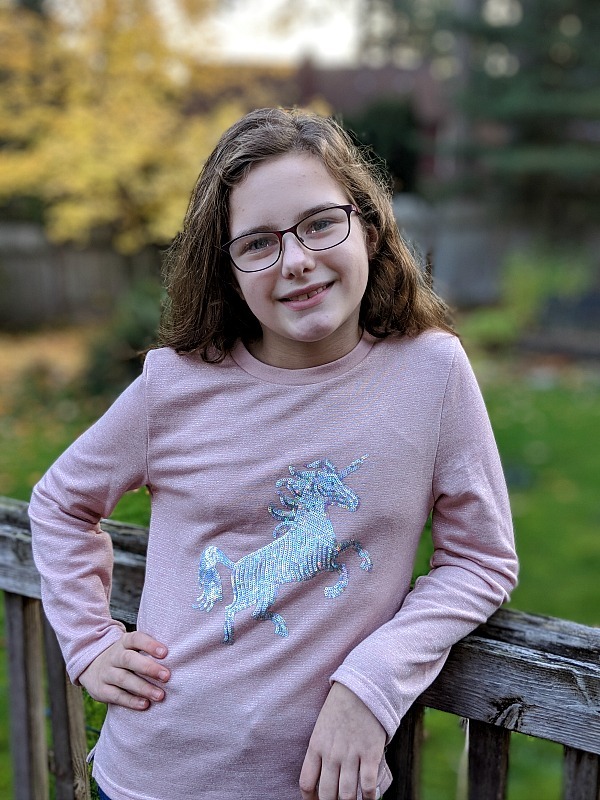 She kept this pullover as it was so perfect for her – sparkly unicorns & pink! 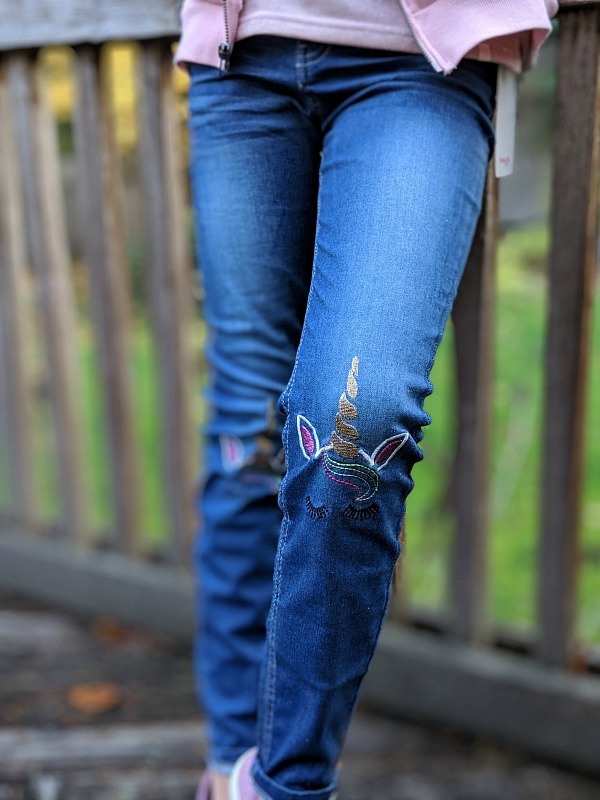 Paisley Sky Girls Janet Skinny Jean – $28 These jeans are so unique & fun – my daughter just loves them & wears them frequently! This was higher than what we typically would pay for jeans, but she fell in love with them and they feel very high quality & lots of room to grow in them. 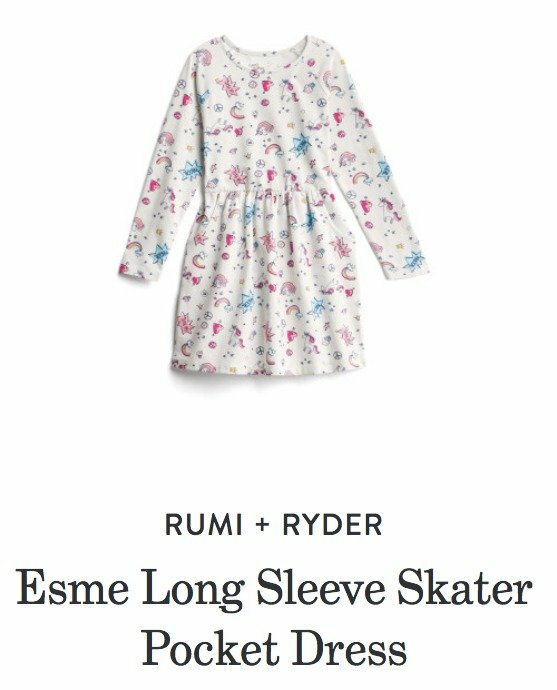 Rumi + Ryder Esme Long Sleeve Skater Pocket Dress – $24. This dress is so comfortable & feels very quality-made. Plus, it has pockets, how perfect for kids & the little things they constantly have in their hands. 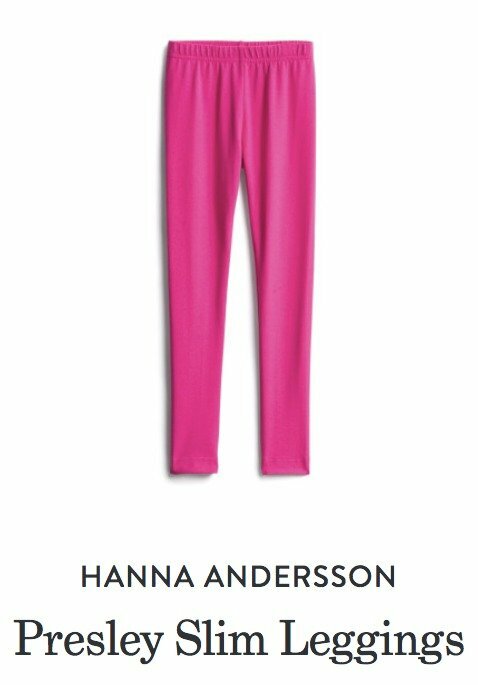 Hanna Andersson Presley Slim Leggings – $16 This brand is always quality & well made. My little gal loved the bright color, too & they paired so well with the dress. 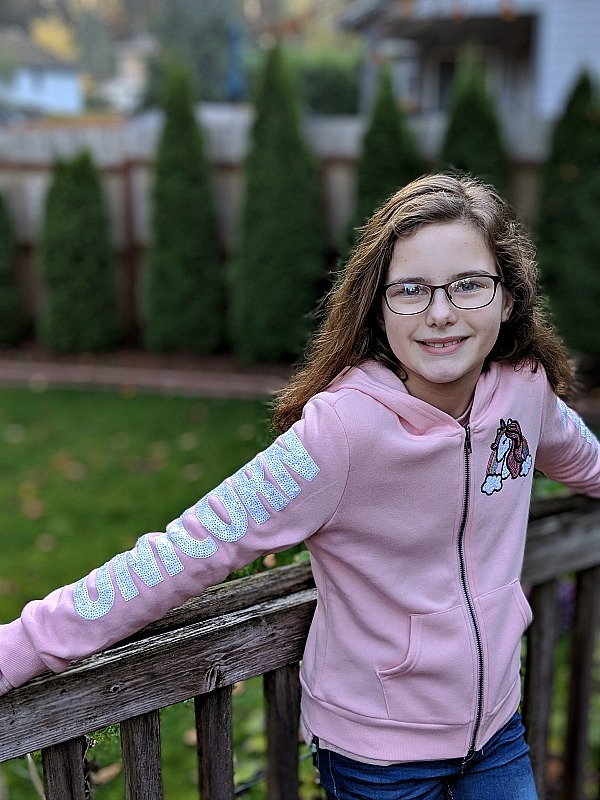 Chenault Girl Cleo 3/4 Sleeve Sequin Graphic Pullover – $26 -This is a darling pullover that has a sequined kitty peeking out of the front pocket on either side. 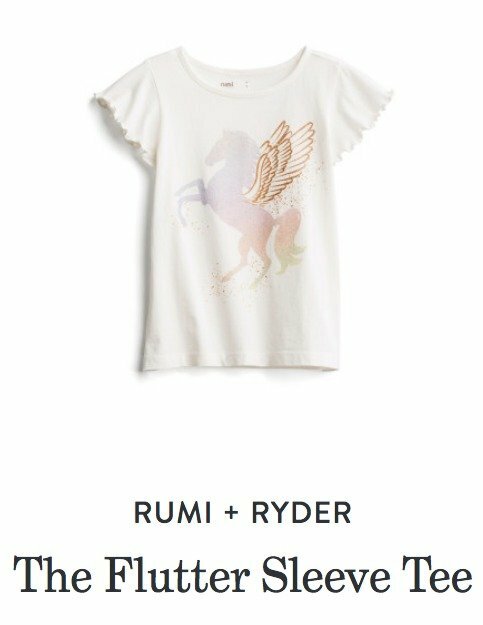 Rumi + Ryder Flutter Sleeve Tee – $14. This is the absolute favorite item for my daughter out of her whole box. 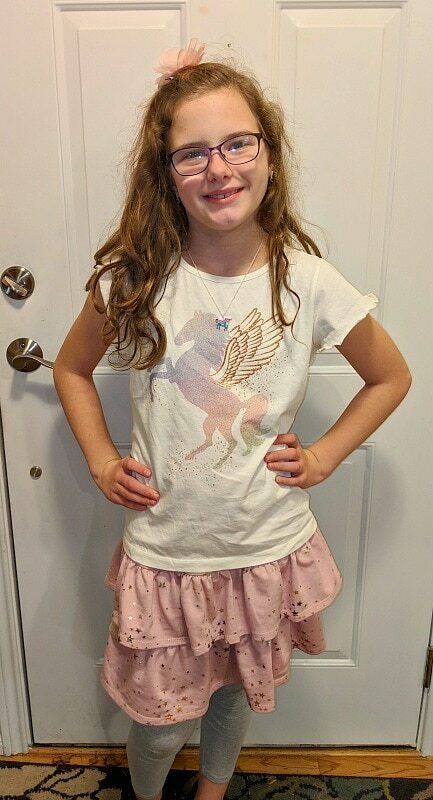 She loves the Pegasus design & the flutter sleeve is so fun & girly for her. 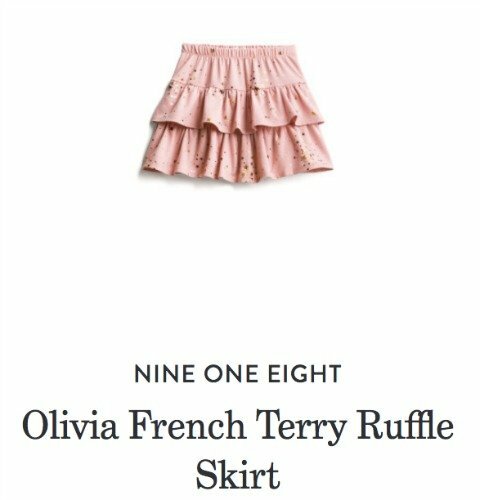 Nine One Eight Olivia French Terry Ruffle Skirt – $20. This is just a darling skirt, my daughter has worn this one many times already! It’s got just a little extra sparkle with gold accents & so versatile. It is darling with the flutter sleeve top too! 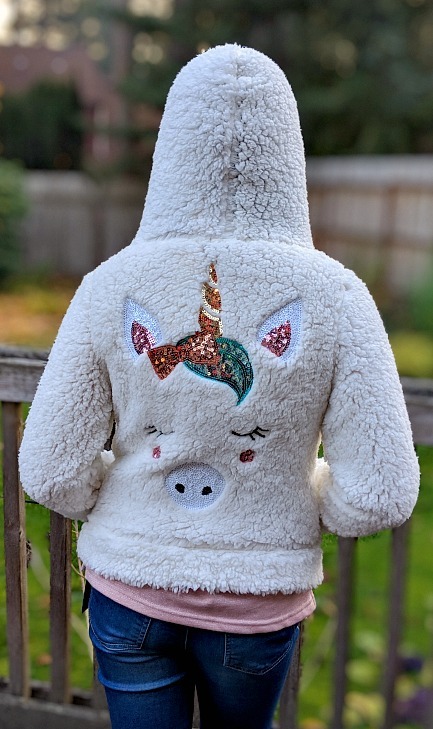 Unicorn Zip Up Sweatshirt/Jacket – This is seriously the softest jacket, so cozy for girls with the darling unicorn face on the back. The sparkle & sequins makes it really stand out, too! Let us know your experience with Stitch Fix Kids – we’d love to hear what you think & what type of items you have gotten in your boxes!